Glaucoma is an eye condition that can develop at any time, but is especially common in older patients. Glaucoma develops when pressure within the eye builds up. As pressure increases, it presses against the optic nerve and eventually causes damage. Since the optic nerve plays a vital role in vision, glaucoma will gradually compromise eyesight, if it is not managed. Routine eye care, including comprehensive eye exams, is key to diagnosing and treating glaucoma before it permanently damages a person’s vision. Before considering a more invasive glaucoma treatment method, such as surgery, Dr. Thomas Byrd will have you try managing your symptoms through the use of medications. Glaucoma treatment with medications can help our Detroit, MI patients preserve their vision by controlling intraocular pressure. Glaucoma medication is most commonly administered via eye drops. There are several different medication options that may be effective in keeping intraocular pressure down and managing glaucoma symptoms. These medications are classified by their active ingredients. A patient may be prescribed one or more types of eye drops, based on their unique needs. Prostaglandins only need to be used once a day. Prostaglandins work by relaxing the muscles within the eye so that fluids can flow in and out of the eye more easily. 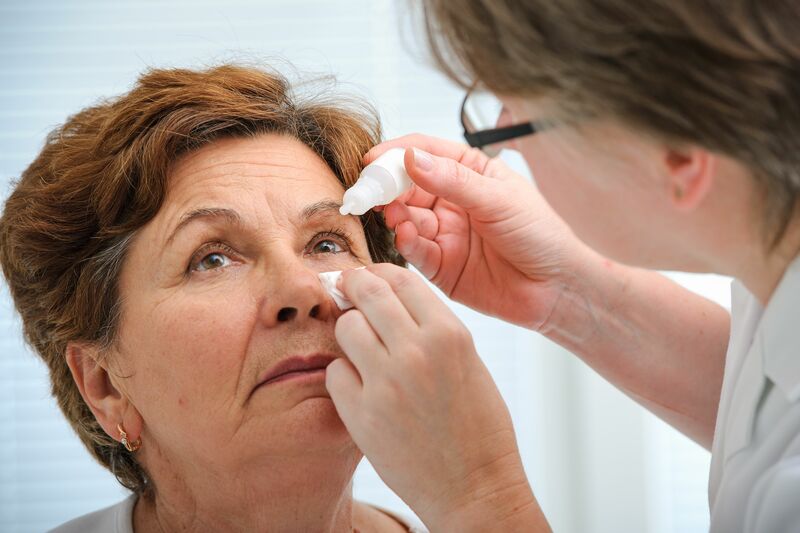 By draining fluids, we can prevent buildup and an increase in eye pressure. Prostaglandins generally have minimal side effects. They include a slight burning sensation, or a change in the length or texture of the eyelashes. Parasympathomimetics are another type of medication that makes it easier for the eye to drain aqueous fluids. This medication works by constricting the pupil, which opens up passages that could be blocked or narrowed. Potential side effects include pain around the eyes, a burning sensation, and decreased night vision. Beta blockers may be used on their own to treat glaucoma, but are more commonly prescribed alongside another medication, such as prostaglandins. Beta blockers minimize intraocular pressure by reducing the production of fluids within the eye. Beta blockers are an effective form of treatment for many patients, but they are not appropriate for those with a history of heart problems because they can slow down a patient’s heart rate. Alpha-adrenergic agonists are similar to beta blockers in that they lower intraocular pressure by controlling the production of aqueous fluids. This medication slows the rate of aqueous production so that fluids can’t buildup. Common side effects of this medication include bloodshot eyes, itching, and dilated pupils. Carbonic anhydrase inhibitors are rarely used alone, but may be prescribed in conjunction with other glaucoma medications. Like many other medications, carbonic anhydrase inhibitors slow down the rate of aqueous production. While this medication is usually prescribed as an eye drop, it is one of the few that is also available as an oral medication. Potential side effects include red eyes, a mild stinging in the eyes, or a bitter taste in the mouth. With appropriate treatment, patients can minimize damage from glaucoma and preserve clear vision. If you have questions about what type of glaucoma medications may be right for you, contact us at your earliest convenience. Dr. Thomas Byrd can perform a thorough examination and create a treatment plan that is personalized just for you. Call (313) 383-1300 to learn more.